In kitchens all over Thailand, ingredients are carefully combined with a mortar and pestle while sticky rice is steamed in baskets made of bamboo. Locals and seasoned travellers alike know what the grinding sound made by a mortar and pestle means: Someone is making som tam. Som tam is a Thai papaya salad. Don't confuse Thai salads with the boring leafy salads the rest of the world enjoys. 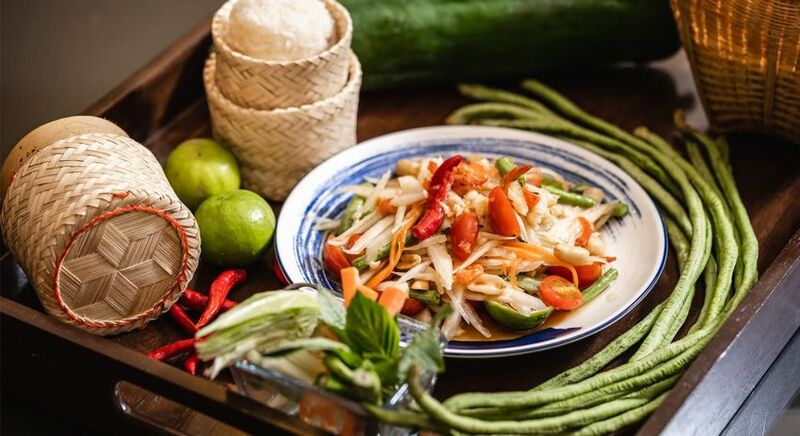 Like most Thai food, som tam teases the taste buds with its sweet, spicy, salty and sour elements. Som Tam is served in restaurants and by vendors at street markets all over Thailand. Each region has a different version of the savoury dish, so be sure to order som tam in every city you visit. Many vendors will prepare som tam in front of you. Don't be afraid to ask the chef to use mild peppers. Not everyone's palate is accustomed to the signature spiciness of Thai food. Different varieties of papaya salad are dietary staples in Laos, Cambodia and Vietnam. It is believed the use of green papaya in salad originated in Laos, the northeast neighbour of Thailand. Green papaya salad is known as tam maak hung in Laos. Tam maak hung is less sweet and more savoury compared to som tam. In Laos, eggplant is often added to papaya salad, and a fermented fish paste is used instead of fish sauce. The theory that green papaya salad originated in Laos explains why som tam is so popular in Isaan. Isaan is Thailand's largest and northernmost region. It also shares a border with Laos. Isaan has a history of taking culinary cues from Laos. The Isaan region and Laos both enjoy sticky rice, brine crabs, olives, tamarind juice and preserved fish. Other regions in Thailand prefer sweeter ingredients and fine jasmine rice. Som tam was originally called tam bak hoong in Lao Isaan-dialect. Bak hoong translates to "papaya." Tam translates to "pounded." Considering how it is made, it makes sense that green papaya salad was once called "pounded papaya." When migrant workers moved from Isaan to Bangkok, they shared their love of green papaya salad. The recipe evolved over the years and was given the Thai name som tam. Som tam means "pounded sour." A unique pairing of ingredients makes som tam as fragrant as it is delicious. It can be enjoyed alone or as part of a larger meal. Fish and grilled chicken are usually added to som tam, but some chefs serve som tam with soft-shell crabs or chicken wings. Som tam is almost always served with sticky rice. Sticky rice takes away the sting of the hot peppers. If you're not fortunate enough to travel to Thailand on a regular basis, you can make your own som tam in less than 30 minutes. A handful of coarsely chopped Thai basil. Som tam sauce is sour with a fiery kick. It doubles as a dipping sauce if you're serving seafood or chicken with your papaya salad. Using a mortar and pestle, combine the Thai peppers, ginger and garlic. Pound the ingredients while you add the anchovy sauce, dried shrimp and lime juice. Continue pounding the sauce with the pestle. The final som tam sauce ingredient is the coconut sugar. The sauce is finished when the coconut sugar is fully dissolved. Traditional som tam recipes call for an unripe papaya. Unripe papayas have a bland taste compared to the sugary sweetness of ripe papayas. The mild papaya balances the flavorful som tam sauce. The unripe papaya also gives a crunchy texture to the salad. Choose a papaya fruit that is green on the outside. It will feel less pulpy than a ripe papaya. The inside of the papaya will be a pale green or white colour. The seeds, which will be black when the fruit is ripe, will look like tiny white pearls. Peel the papaya's skin with a knife or potato peeler. Remove the papaya seeds. Rinse the peeled fruit to remove any excess acid. Now that the papaya is peeled, it's time for the fun part. Place the fruit on a cutting board and hold it firmly in place with one hand. Use your dominant hand to carefully hack into the papaya's outer layer. The cuts should be long and close together. After you've hacked the entire papaya, gently scrape the surface of the fruit with your cleaver. You should end up with slivers of papaya similar to the shredded cabbage used in coleslaw. It might take a few tries until you get it right, but it's worth the effort. There's something strangely satisfying about hacking into a papaya. Once you have the hang of using a cleaver, you can ditch the cutting board. Hold the fruit in one hand and hack with the other. Just be careful not to cut yourself in the process. If you're really struggling with the papaya, try using a cheese grater. It won't feel authentic, but it will still taste delicious. You're almost finished! Add the green beans, roasted peanuts and tomatoes to your sauce. Mash everything together using the mortar and pestle. Next, you'll want to add the shredded papaya to the mix. Pound everything together to ensure the papaya is infused with the flavor of the sauce. If you're feeling fancy, you can add mint and basil to the top of your som tam. There are recipes for different varieties of som tam, but we recommend getting creative. Come up with your own version. Some people add carrots, while others use palm sugar instead of coconut sugar. There is no wrong way to make a green papaya salad. Som Tam & Chardonnay Restaurant is a bright, spacious dining destination based on an East Meets West concept with exquisite Thai cuisine complemented by international specials and a wide selection of fine wines to bring out the flavour of the freshest ingredients. The restaurant lives up to its name with no less than 5 different Som Tam dishes on the menu, served with shrimp, soft shell crab, fish, Thai sausage or even as a mixed fruit platter. Som Tam & Chardonnay opens onto the expansive pool terrace and is also the venue for the daily gourmet breakfast, an indulgent spread providing a nourishing start to an inspiring day in the city.